[QUOTE=Dwight Schr-Ute;116095]Just a kid checking out his ex girlfriend’s Instagram. Anyone else think that's a weird look for this kid? If we caught Covey at a BYU game I'd be like WTF? Twitter just told me that our 541 yards is the most ever for Utah in the Pac-12. Back to back to back 40 point games. I don't. The kid has grown up a Utah fanatic in SLC. I imagine if I played for the second best school in the state (and had never been offered by Utah) I might show up to watch the Utes wearing USU gear. Maxs Tupai has been a revelation over the past 2-3 games. The guy was all over the field last night. I had sort of written him off as a bust, but he has been excellent. While Mika Tafua has disappeared. I didn't even notice him the past few weeks. Has he been hurt? Was it Tupai that nearly killed Fink? That was brutal and an amazing play by a DT at the sideline. Just a kid checking out his ex girlfriend’s Instagram. I think we’d be surprised by the number of players that attend different games. 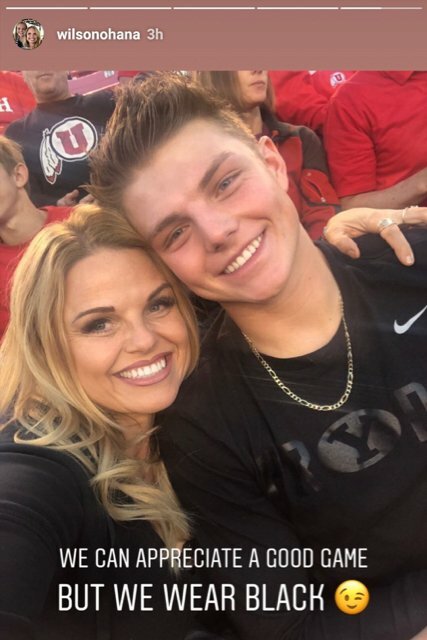 Apparently we had several players at the BYU v Hawaii game last Saturday to support friends. Tafua was out the past two games. He made a couple of big plays last night. Ouch. It looks like Tupai gave Fink three extra yards and three broken ribs. I think that mean Jack Sears will start this week? He’s getting the starters reps. A lot will depend on the concussion protocol for Daniels. Brady Poppinga understands bro. He understands. I rewatched the first three quarters of the game during my lunch break (thanks Pac-12 football in 60). I was amazed by our tackling all game long. For example, Maxs Tupai is the only defender on a sweep AND he's trying t fight off a block. He forces the runner inside, which in and of itself is amazing but then he reacts to the cut and tackles the guy for a loss. Also, Javelin Guidry all alone in the flat fights off Pittman's spin move and makes an ankle tackle. Lots of other examples. These are two yard gains which easily could have gone for 20+. Props to the D.
It's like beating them twice in the same game. With notes about Jack Spears being the likely starter on Saturday, we might get to beat them again when they drop their game against ASU. 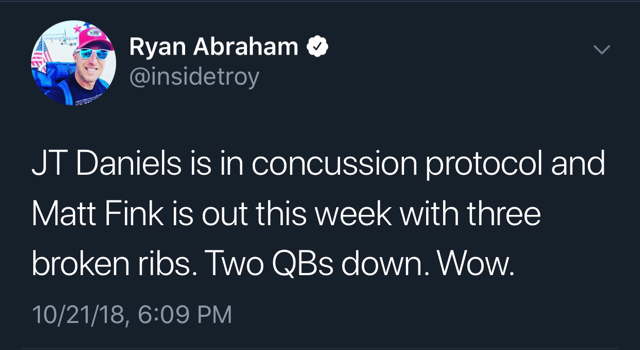 I look forward to a similar situation this weekend when we beat the Bruins on the field and then when Jayden Daniels announces his commitment to the Utes. Max Browne breaks it downe.